Our KS3 & KS4 students have had another busy term in Food and Catering. With all this sunshine Year 7 have been busy coming up with salads bursting with colour all ready for summer! They have had a great time experimenting with presentation and we were most impressed with each student's own take on Super Rainbow Salads! Mini Victoria Sandwich Cakes fit for Royalty! Year 9 have been showing off their decoration and presentation skills by making individual sized Victoria Sandwich Cakes. They were very proud of their creations and we are too! Year 10 Pastry Chefs in the making! Year 10 excelled in making some fabulous profiteroles this week. 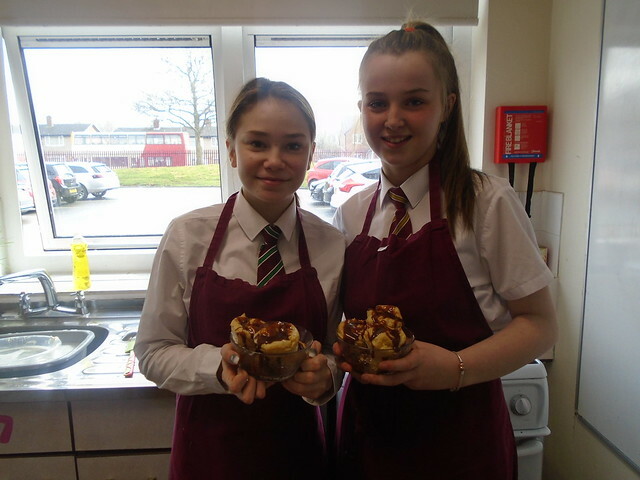 They showed off their high level skills by making choux pastry, piping cream and then making chocolate sauce. Mr Arkell and Mrs Tomlin also happened to pop in at just the right moment for some taste testing! Well done Year 10!